I’ll preface this post by saying that I am an unabashed Copper Onion fan. I really enjoy just about everything about this place. I love the fact that it is owned and ran by Chef Ryan Lowder and his wife. I love that Chef Lowder worked at a 3-star Michelin restaurant, as well as numerous restaurants throughout the worlds, prior to coming back home to Utah. I love that his restaurant is elevating the culinary atmosphere in Salt Lake. I love the fact that Chef Lowder focuses on sourcing as many ingredients locally as possible (Snake River Farms, Niman Ranch, Creminelli, and Central Milling are a few of the purveyors). I love the fact that the kitchen is out in full view of the diners. For many of us, it’s the highlight of the night to be able to watch the food being prepared, rather than magically being brought out from the back of a mysterious kitchen. The food at The Copper Onion is honest and much of it is rooted in comfort. At a recent meal, we enjoyed the patatas bravas, which were perfectly-cooked cubes of potato topped with a perfectly-spicy aioli. Roasted cauliflower was perfectly cooked and tossed with a deliciously tangy anchovy-caper cream sauce. I had the chance to try the newly-added-to-the-menu wagyu beef stroganoff. Made with house-made pappardelle and topped with creme fraiche, it was the epitome of elevated comfort food. The wagyu beef is tender and rich. If you haven’t been to The Copper Onion, you must try the ricotta dumplings, which is one of the most popular dishes on the menu. Another favorite of many is the pork belly salad, which I have yet to try. The dessert menu is also very expansive. We had two scoops of the house-made peppermint ice cream, which was slightly disappointing. It was icy and had a grainy feel to it. Their bread pudding is one of my favorite desserts in Salt Lake. And if you catch them on a good day and ask nicely, they’ll even fry the bread pudding for you for an added level of decadence. They used to fry every bread pudding order, but found that it was holding up the fryers and backing up the entire kitchen, so now they only do it upon special request. Service is also head and shoulders above many other restaurants. Clint (Mr. Moustache) is the head of service and is absolutely accommodating and friendly. Johanna has been our server for the past few times we’ve visited, and she is always gracious, patient, and fully understands the menu and knows ingredient sources. If you want a special treat, request to sit at the bar which borders the open kitchen. From this perspective you will be able to watch Chef Lowder and his sous chefs work up close and personal. 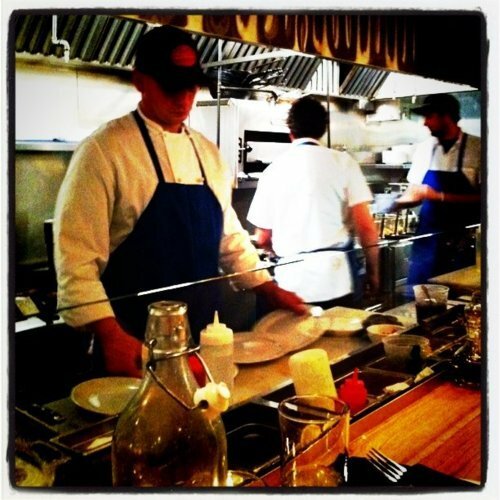 Chef Lowder is a friendly guy and is glad to chat about food across the bar (as long as it’s not 8 pm on a Saturday!). Be sure to call ahead for a reservation, as the popularity of this New American restaurant is spreading quickly.